My neighbour and I have huge trees in our yards. Not little saplings, we’re talking 25 metre monsters. And lots of them. And they drop branches. Man, what look like small branches way up there, are ginormously huge when they fall down. So, as men sometimes do, we bought chainsaws. Him first, me some time later. Luke* managed to drop a few smaller trees until he got one wrong and it fell through our other neighbour’s fence and straight into their lounge. Whilst they were watching TV. I did OK with the small stuff until the bigger stuff started to clearly define itself as hard, dangerous and quite likely to end in tears. And yet, it was so easy to buy the chainsaw. You know; Have tree. Buy chainsaw. Cut. Kinda like buying a box of technology to fix your marketing automation challenge. Have marketing challenge. Buy marketing automation tech. Campaign. A few months later I got a professional outfit in to fell one of the trees. They too had chainsaws. But you see, this is all they do. They’re experts not at using chainsaws per se, but at creating tree related outcomes (!). And much like buying marketing automation, your challenge is to manage, change or create customer behaviour outcomes – not become technology experts. No matter how good the chainsaw I buy, or how long I practice with it, I’m never going to recognise a double gnarl joint that will make the chainsaw kick back unexpectedly, understand why a tree sometimes falls the wrong way because of root structure (true story), or recover from the inevitable major (or lethal) accident any expert would have seen miles off. I don’t want to become a chainsaw expert. I just want the tree gone. If you’re chasing an outcome, invest in a skilled team that delivers outcomes. You shouldn’t care which “chainsaw” they use. 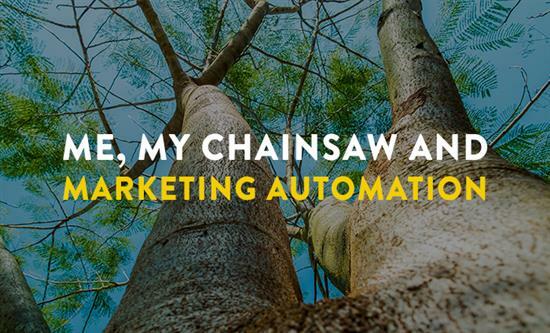 So, next time you’re looking at Salesforce, Adobe, Oracle, IBM, SAS, Marketochainsaws, remember it’s not the chainsaw, it’s the fact you’re either going to be the one holding it, with little help from the chainsaw company, hoping for the best, or investing in a group of people who will deliver your outcome, regardless of the tech used.